Estádio Universitário de Lisboa (EUL for short) is a sports complex with large green spaces accessible to everyone right in one of Lisbon’s busiest areas. It was born to serve the academic community that is established in that area of the city and to provide students and teaching staff with affordable access to sports facilities. It is not necessary to be enrolled in any specific sport activity to access EUL, and sports are lived and breathed throughout its 40 hectares. People from all ages and nationalities enjoy this place: in the large alleys as well as in the green spaces you can find people doing everything from run, cycle, play ball, or even walking the dog. It’s no wonder that from the early morning joggers to the Lisboners who just want to stretch their legs a bit after dinner time, everyone likes to spend time here: the place brings serenity and it feels secure. My favorite part about EUL is the green area: as a rookie runner it is nothing but a privilege to run in a peaceful atmosphere, while being so close to one of the busiest roads in Lisbon. It is truly a place of tranquility among the madness, and that feeling that I am running in a little oasis really makes me happy. 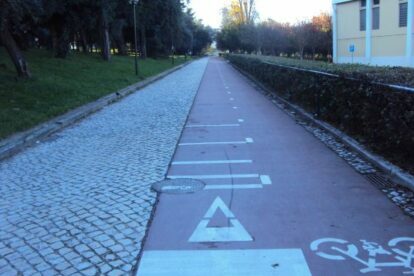 In case you’d like to go for a jog while in Lisbon, try it out and see it for yourself!